I’ve been on the look out for yellow (or purple) bedding with a graphic pattern for my daughter’s new bed (see my previous posts). It turns out that if you don’t want everything in a shade of pink, you do not have nearly as many options. If money were no object I would probably buy this lovely cover from Ferm Living but with little change from £100, that’s never going to happen. This bold elephant print from Hunkydory Home would make great bedding but is currently only on a cushion and a lightshade. 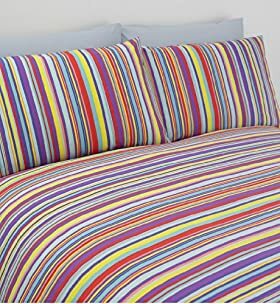 So spreading my search a little wider, I started looking for cheerful multi-coloured bedding with enough yellow and purple in it to satisfy my daughter. I was going to buy a block patterned cover from La Redoute but had such difficulty with their online ordering that I gave up. I finally settled on this multi-coloured stripe bedding from Marks & Spencer which I don’t think this image does justice to! I can’t wait to put it on the bed that I’ve started painting grey, with a lovely butterfly cushion my daughter chose and a purple blanket I have customising plans for! It has some great stuff baby / kids stuff that isn’t all pastel colours and sad looking rabbits. There’s some nice yellow bedding with white clouds on…not sure that it’ll be big enough for the big girl bed though. Evelyn’s nursery has a red and taupe colour scheme – I can’t be doing with pink! How are you and the lovely Evelyn? I’m sure the name rings a bell but I’ve never seen the website before… I think I’m actually glad I didn’t know about it when mine were babies as I would have spent a lot more money! Sadly the clouds bedding is too small but I quite fancy a grey spotty lampshade and a bespectacled yellow teddy bag! Amazon is best for finding cheap bedding. If you cant find the exact print you want in the colors you want try buying sold colors and using fabric modge podge (washable) to cut out the bold prints such as the elephants from other fabrics and attach to solid bedding. This will give the bedding a textured unique look. I’m sure you can find the elephant fabric online for much cheaper than bedding. Use to make curtain, wrap shelves, drawer lining to add the elephant touch. First of all, I really like the blog. Good work Jo! Second, the website you mentioned looks great Caroline. Starting to think nursery this weekend, and I’m particularly taken by the badger rug and fox cushions. Lisa may take some persuading though. David – you’re too kind. I’m sure you could sneak in a woodland animal or two!